Gorgeous Archival Digital Fine Art “Enchanted Bloom” with Lavender overtones. 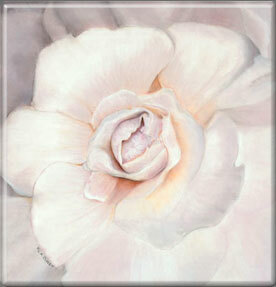 This soft sensual inviting flower looks fabulous from any angle! Perfect for the home spa, living-room, or relaxing bedroom. The swirling pattern of these delicate petals creates an attention-grabbing effect that reminds one of the amazing symmetry of nature. 20″ X 20″ – Stretched on Wooden Frame – Wrapped Canvas Archival Digital Fine Art– Continuing Design on All Sides, $650 ea. This beautiful Rose is alive with depth and softness highlighting a sort of dewy touchable texture as if it were telling a story about its surrounding environment with soft blue overtones create a cool and soothing mood. Bring a romantic aura instantly to any environment with the natural lushness of azure petals bursting with life! It’s like a corsage for your wall that never wilts…so fresh and frilly, you can almost smell it! 20″ X 20″ – Stretched on Wooden Frame – Wrapped Canvas Archival Digital Fine Art – Continuing Design on All Sides, $650 ea. The subtle pastel colors used in this floral painting gives an exciting whirling sensation with delicate petals spiraling round and round embracing the center bud waiting its turn to greet the day. Gentle green overtones bring an earthy, garden-fresh feel to your favorite indoor space. Celebrate nature every day in your own home or office with the elegance and grace of the Enchanted Bloom in Green. Brighten any wall with the Enchanted Bloom in Gold and create an instant focal point that will surely be a conversation starter for all who view it. Rich Golden hues bask this bursting bloom in heavenly splendor! Subtle enough to compliment almost any décor, yet dramatic enough to grab the attention of anyone who enters the room, you will surely appreciate the versatility of this amazing work of art. Adorn your wall with this earthy yet out of this world masterpiece.